With a fresh new look, it's packed with articles and advice to help maintain high quality golf and sports turf surfaces. 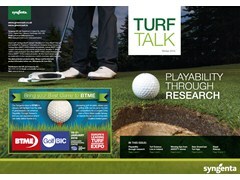 Take a special look at Playability Through Reserach, and what's in store with Syngenta for BTME 2016. Click here or on the image below to download your copy.